We recommend starting the movie in Colorado no earlier than sunset. For best picture, wait until it is dark outside (darker the better). 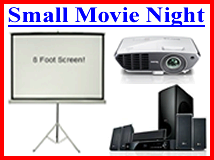 -The Small Movie Night is recommended for crowds of up to 30 people indoor or 15 people outdoors. Can be used indoors if you have at least a 8 foot ceiling. 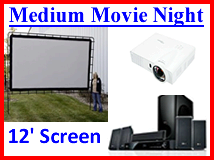 -The Medium Movie Night is recommended for crowds of up to 50 people indoor, or 25 people outdoors. Can be used indoors if you have at least a 16 foot ceiling. 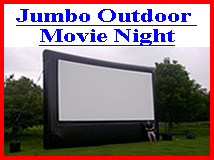 -The Large Movie Night is recommended for crowds of up to 250 people outdoors, or 400 people indoors. 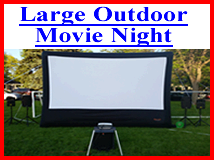 Can be used indoors if you have at least a 15 foot ceiling.